A portrait of businessman standing against London rooftop view panorama. Copy space. A portrait of woman standing by the window against London rooftop view panorama, using tablet. Copy space. 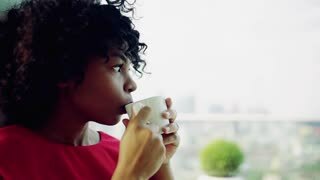 A portrait of woman standing by the window against London rooftop view panorama, holding a cup of coffee. Copy space. 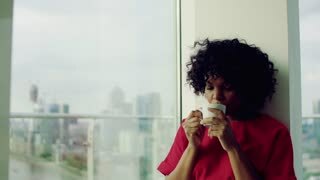 A portrait of woman standing by the window against London rooftop view panorama, holding a cup of coffee. Copy space. Slow motion. 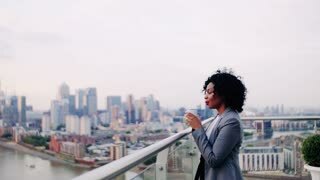 A portrait of woman standing in an office by the window against London rooftop view panorama, using tablet. Copy space. Slow motion. 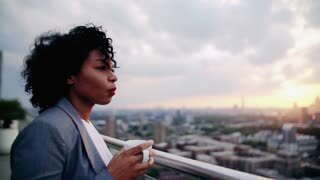 A portrait of serious woman standing by the window in an office against London rooftop view panorama. Copy space. Slow motion.